DeFelsko manufactures a portable instrument that is ideal for measuring the adhesion strength of coatings on a variety of substrates. To accurately measure the pull-off strength of coatings with varying bond strengths to their respective substrates. The PosiTest AT pull-off adhesion tester, along with proper selection of dolly size, enables an operator to accurately measure the bond strength of most types of coating applied to any rigid substrate. The expected tensile pull-off adhesion strength and industry standards are two prime factors in determining the correct instrument for an application. When higher pull-off strengths are required, the PosiTest AT can be used with custom sized dollies to attain higher pull-off strengths. For example, a 14 mm dolly provides double the pull-off strength of a 20 mm dolly. With 14 mm dollies the PosiTest AT can attain pull-off strengths as high as 6000 psi (40 MPa). Similarly, a 10 mm dolly provides approximately four times the pull-off strength of a 20 mm dolly. With 10 mm dollies the PosiTest AT can measure up to 10000 psi (70 MPa). When standard included 20 mm dollies are used, the PosiTest AT is designed to provide up to 3000 psi (20 MPa). When custom dollies are utilized the operator simply selects the dolly size and the PosiTest AT automatically calculates and displays the true pull off strength. The 10, 14, 20 and 50 mm dollies commonly offered by DeFelsko are shown in the figure below. The PosiTest AT with optional 50 mm accessory kit is ideal for measuring lower pull-off strengths under 500 psi (3.5 MPa) such as coatings on concrete. The accessory kit includes 50 mm dollies which are standard in most specifications that involve the testing of tensile bond strengths of coatings on concrete. When testing on concrete, typical failures are cohesive within the concrete, not between the coating and the concrete. With proper cutting around the dolly, the instrument can be used to measure the tensile strength of uncoated concrete, as well as concrete repairs. Pull-off adhesion testing is a measure of the resistance of a coating to separation from a substrate when a perpendicular tensile force is applied. Coated substrates typically include metals, plastics, concrete, wood and glass. Coatings, finishes and linings vary greatly and include paint films, powder coatings, UV cured, ceramics, epoxies, bitumens (tar enamel, asphalt mastics), thermoplastic resins (polyethylene, vinyl and plastisols), laminates, lacquers, varnishes, specialty resins (urethanes, fluorocarbons, phenolics and polyesters), elastomerics, and inorganics (glass, zinc, and lead). There are very few industry or application specific pass/fail criteria defined in standards. Expected adhesion testing results are often predetermined by the parties concerned. Dependent on the accuracy and repeatability of equipment involved, large variations have been noted between various equipment and manufacturers. To minimize these undesired variations, it is critical to utilize an adhesion tester that minimizes shear forces (forces acting parallel as opposed to perpendicular to the coating). The PosiTest AT series is specifically designed for this purpose. It possesses a self-aligning feature that utilizes a spherical articulating dolly head so that it is always pulled vertically by a ring of small bearings in the actuator. Adhesion testing may be performed for quality control purposes, but is more typically undertaken to adhere to industry standards and customer specifications. Dependent on the application, the specific need for maintaining strong adhesion may vary. Coating applications may range from consumer products to large scale construction projects, but a common factor is that premature adhesion failures can have a significant cost. A well known adhesion failure in the automotive industry involved the failure of paint on a particular model of minivan. A commonly reported problem, the cause was eventually attributed to the spray primer utilized. The primer blistered, causing the paint to peel after continued exposure to heat and direct sunlight. 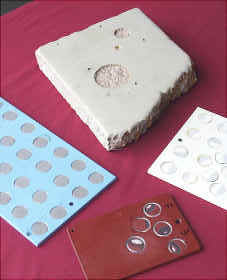 Significant warranty claims and reputation loss could have been avoided during the development phase by combining life cycle and environmental testing with adhesion testing. In construction and maintenance work, the epoxy coatings used to protect steel require strong bonds to prevent wear and corrosion. Failure of a coating applied during a large project such as a 500,000 ft2 (45,000 m2) bridge could result in permanent financial damage to the contractor due to significant rework and lawsuit costs. A PosiTest AT was purchased by the company responsible for maintaining the Golden Gate Bridge in San Francisco. Maintenance of such a bridge is a year round activity with no time available for unnecessary repairs or rework. In the design phase of coatings, as well as their application processes, adhesion testing is often used to test and verify adhesion capabilities. For example a technical article, Adhesion of Sealers on Thermal Spray Coatings1 documents the use of a PosiTest AT to quantify the adhesion strength of naturally occurring oxide sealers in thermal spray coatings versus the use of actual penetrating seal coats. Pull-off test results for the penetrating sealer identified a 183% improvement over the oxide seal, clearly quantifying their potential adhesion benefits. Adhesion Testing is also utilized to demonstrate the capability of coatings, a potential requirement of contract negotiations. As identified in an Amchem Products website application note, Mounded Bullet Tanks2, a PosiTest AT was utilized as part of the verification process for 386/9000. Purethane® is a polyurethane coating intended for coating large steel mounded LPG bullet tanks. By following ASTM Standard D-4541, Amchem was able to demonstrate that their product met all the requirements of relative NACE standards. Even in established coating application processes, many factors can influence the adhesive strength of a coating. Seemingly minor variations in process parameters may have significant impacts on the resulting adhesion strength between the coating and the substrate. 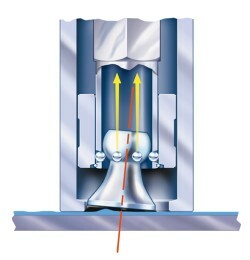 As discussed in Finish Coatings System Adhesion and Test Methods3, some of the variations that may affect mechanical and chemical bond strengths include the thickness of the applied coating, climatic conditions during painting, cure times and temperatures, substrate and coating moisture contents, inadequate surface preparation methods, surface contamination, substrate densities, coating formulation, preparation and mixing parameters. As discussed throughout this article, markets for adhesion testing range from Research and Development Labs that develop and test coating and application processes, through to the Contractors, Coaters, Finishers and Inspectors involved in applying and testing the actual applied coatings. 2Website application note "Mounded Bullet Tanks" by Amchem Products Pvt. Ltd.